You might be surprised as to the value of boxes of paper ephemera stuffed away in a garage. Experiences in life can be our greatest teachers, and this story explains why Judith knew this particular collection of papers at an estate was significant. Pictured below: Owner Andy Granatelli, Driver Parnelli Jones, Master Mechanic Dan Quella (Judith's Great Uncle). Judith's great uncle, Dan Quella, was a master mechanic working with Andy Granatelli at the Indianapolis Motor Speedway in the 1960s. Here Dan is shown on the right (with white hair), standing behind Andy Granatelli's car. 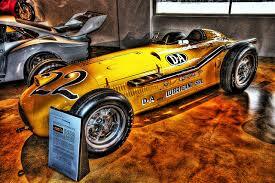 The driver was Parnelli Jones. When Judith told her uncle Dan in 1979 that she had moved to Fresno, California, his eyes lit up and then got a little teary as he folded his arms, nodded his head slowly, and stated with reverence, "Ah, that's where Billy Vukovich was from." For those familiar with racing legends, Vukovich raced at Indy five times, winning in 1953 and 1954, but tragically died in a crash there in 1955 at the age of thirty-six. It was a sobering story which is still repeated, almost prayer-like, amongst all who honor the history of racing. Race car drivers and mechanics can be perceived as a wild bunch, but there is a code of honor that is upheld across generations of racing families. Life is a fragile gift when you are driving that fast. Family is of great significance when you know one wrong move could end your presence in their lives forever. The bond between owner, driver, mechanic, and the entire team is a sacred trust. There is an unspoken but deeply felt reverence for the exhilarating speed of a powerful race car. A quietly devout and humble man, Dan Quella knew it was his solemn duty to protect the lives of his drivers above all else. Pictured above is one of many race cars Judith's great uncle, Dan Quella, built. This one is in the Peterson Automotive Museum. In addition to racing and building many of the finest race cars you could ever hope to see in his younger days, Dan's expertise as a mechanic was sought out by people all over the world, even towards the end of his life. An autographed photo from Judith's family collection shows Dan Quella and Indy racer Bob Sweikert in May, 1956. Bob Sweikert won Indy the year before, in 1955. The legendary Billy Vukovich died in a horrific crash during that same race. Although Bob placed sixth at Indy in 1956, this photo documents his last Indy race. Bob Sweikert tragically died in a sprint car race less than a month after this photo was taken. When Dan Quella passed away at the age of eighty-six in 1990, his sons did a lap at Indianapolis. Dan Quella's spirit remains at Indianapolis to this day, along side that of many other legends of the fine art and sport of racing. In the 1960s, Judith recalls, she got a tour of Uncle Dan's garage during a family celebration at his home in the suburb of Westchester, California. The garage floor was spotless, painted grey; the walls, gleaming white. Tools were carefully arranged like surgical instruments, ready for the skilled hands of a master. Two huge engines lay suspended on a special rack, covered with shrouds. The fabric was slowly and respectfully withdrawn to reveal two enormous Offenhauser engines to the assembled audience of friends and family. Although Judith will never possess the mechanical skill with automobiles that her Uncle Dan had, that moment in his immaculate garage, gazing at two of the greatest racing engines of all time, left an indelible impression. Racing and the appreciation of finely crafted mechanical wonders is a sacred calling to those who devote their lives to it. So, FIFTY YEARS LATER, Judith walked into a gentleman's garage in Fresno, California- plush padded white carpeting underfoot, thickly insulated walls and doors, draperies hung over the windows, and an amazingly pristine c. 1953 European Hazet metric tool cabinet. The guys who were organizing the estate casually placed a couple of boxes of booklets, magazines, repair manuals, papers, and photographs on a table. Because of her experience with her great uncle Dan's Offenhauser engines in an immaculate temple of a garage, Judith knew this was also the garage of someone serious about automobiles. She spent hours going through those boxes of history that could have been quickly lost in the depths of a dumpster. One discovery after another began to paint the picture of a gentleman's lifetime devotion to automobiles and racing. The items depicted in this video represent a small selection of photos and paper ephemera found in those boxes at the estate of a gentleman. Born in Austria and possessing an uncommon appreciation for automobiles and motorcycles, he eventually owned and meticulously cared for an original early 1950s Mercedes-Benz 300SL, also known as The Gull Wing. In 1962, he became the founder of the Mercedes-Benz 300SL Gull Wing Group, an organization of loyal and devoted Gull Wing owners from around the world. The boxes were all purchased by one individual within the first ten minutes of the estate sale. They had seen the photographs we posted prior to the estate sale and thankfully recognized the historic value of the collection. We were honored to help assure that this gentleman's treasures would be appreciated, valued, and preserved. The moral of this story is NEVER throw things away until your Estate Sale Consultant takes a look. It's really quite amazing what ends up having significant value as a collectible. It takes a trained eye, perceptive intuition, and a lifetime of memorable experiences to discern that.